Kate Hudson Hits the Big 4-0 … See The B-day Babe Flexin' Her Fourties! Guess The Celebrity Baby Bump -- See Who's Poppin' Pic! The United States military is conducting a formal investigation into American soldiers burning the dead bodies of what appear to be Iraqi insurgents. TMZ obtained 41 pictures that we're told were shot in Fallujah in 2004. Two pictures show a Marine appearing to pour gasoline or some other flammable on the remains of what officials believe are 2 insurgents. Two other photos show the bodies on fire. You then see charred remains. Another photo shows a Marine crouched down next to a dead body and mugging for the camera. Still another pic shows a Marine rifling through the pocket of the pants on a corpse. We have not included all of the photos. Many are just too gruesome. 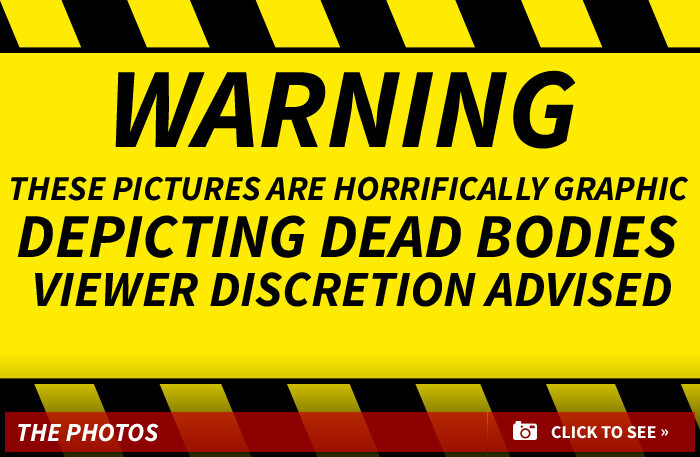 There are well over a dozen bodies in the pics and some are covered with flies and one is being eaten by a dog. We turned them all over to the Pentagon last week, and a Pentagon official tells us the pics have triggered a Marine Corps investigation. We're told U.S. Central Command -- the organization in charge of military operations in the Middle East -- also reviewed the photos to determine if they had been previously brought to their attention and determined they had not. Col. Steve Warren, Director of Press Operations for the Dept. of Defense, tells TMZ ... the pictures appear to show U.S. soldiers in violation of the Uniform Code of Military Justice ... which makes it a crime to mishandle remains. There is no statute of limitations on the crime -- even if the soldiers are now private citizens ... they can still be prosecuted, which could land them behind bars. Col. Warren tells TMZ, "The actions that are depicted in these photos are not in any way representative of the honorable, professional service of the 2 1/2 million service members who went to war in Iraq and Afghanistan in the last decade." ... Zedd's Got Nothing On My Abs!!! HERE'S THE RUNDOWN Justin Bieber Sued for Running Over Photog Michelle Obama Concerned in Paris During Notre Dame Fire Mayor Pete Getting Major Hollywood Support Marlon Wayans Calls Out "Game of Thrones"